The Chamber of the Holocaust, Israel's first Holocaust museum, is a small museum located on Mount Zion in Jerusalem. It was founded in 1948 and contains plaques memorializing more than 2,000 communities which were destroyed during the Holocaust, ashes of victims from the Oranienburg Concentration Camp, and desecrated Torah scrolls which were recovered from war-torn communities in Europe. Many survivors hold memorial services here on the anniversary of their town's destruction by the Nazis. 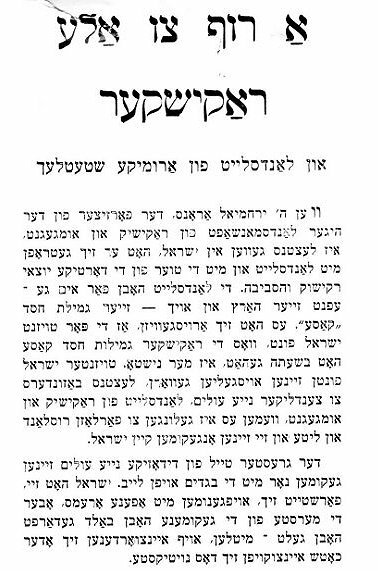 When I visited the South African Jewish Board of Deputies in Johannesburg I discovered this flyer, which must have gone out to all members of the Rakishker Society. An English translation, done by Gloria Freund, follows the original Yiddish. 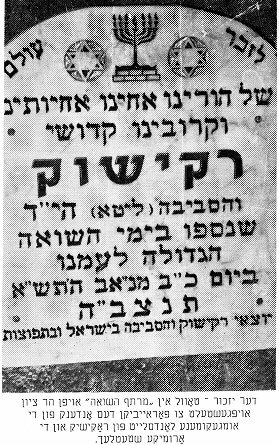 The memorial tablet in Martef haShoah [Chamber of the Holocaust] on Mount Zion, erected to immortalize the memory of the landsleit from Rakishok and the surrounding areas who perished. Filling me with the sadness of the street. The road is slippery and wet. At only the age of eight. She escorts the Shabbos out. In the hearts pleasure, good. The herring baked in cabbage. Giving clear shape to my dreams. When Mr. Yerachmial Arons, the Chairman of the local landmanschaft of Rakishok and vicinity, was last in Israel, he met with landsleit and with volunteers from the Yotzei Rakishok Ve-ha-seviva [Immigrants from Rakishok and vicinity]. The landsleit opened their hearts to him and also – their interest-free loan “office.” It turned out that the few thousand Israeli pounds that the Rakishok Interest-Free Loan Office had at that time is no longer there. Thousands of Israeli pounds were loaned, most recently, to the dozens of new immigrants, landsleit from Rakishok and the surrounding area, who were successful in leaving Russia and Lithuania and came to Israel . It is unnecessary to say that ignoring the empty cashbox and knowing that they could depend on the help of their hundreds of distant landsleit in South Africa , the Rakishokers in Israel borrowed and lent. No one who came for an interest-free loan left empty handed. Giving the applicants only several hundred Israeli pounds helps, but not enough. In most cases, they lent a thousand Israeli pounds. As a result, the Rakishok Interest-Free Loan Office in Israel has no money. This is seen in the account books that the responsible Rakishoker volunteers presented. They turn, therefore, through the local Rakishokers, for help so they can give further interest-free loans to the Rakishoker landsleit who came from Lithuania and Russia to Israel, and also to needy Rakishokers who have been living in the country a longer time. The landsleit in Israel have confidence in the brotherly generosity of their brothers and sisters in S. Africa . They do not ask for many thousands. Several thousand local Rands will help them provide immediate aid where needed. Landsleit from Rakishok and the surrounding shtetlekh who live in Johannesburg, Cape Town, Port Elizabeth and other cities and towns across the land are asked to send in their contributions for the Rakishok Israel Interest-Free Loan Fund (and the sum is left to each of you individually), each according to his ability and wishes, to the Chairman of the local Rakishokers, Yerachmial Arons, to Post Box 3302, Johannesburg, check made out to the Rakishoker Society. Tel. 838-7927.